Theoretical physicists have been predicting that it should be possible for knots to form in quantum fields for decades, but nobody could figure out how to accomplish this feat experimentally. Now an international team has managed to do just that, tying knots in a superfluid for the very first time by manipulating magnetic fields. Led by David Hall, a physicist at Amherst College, and Mikko Möttönen of Aalto University in Finland, the group describes their groundbreaking achievement in a new paper in Nature Physics. It’s tough to visualize these exotic objects, but they are essentially particle-like rings or loops in a quantum field connected to each other exactly once. 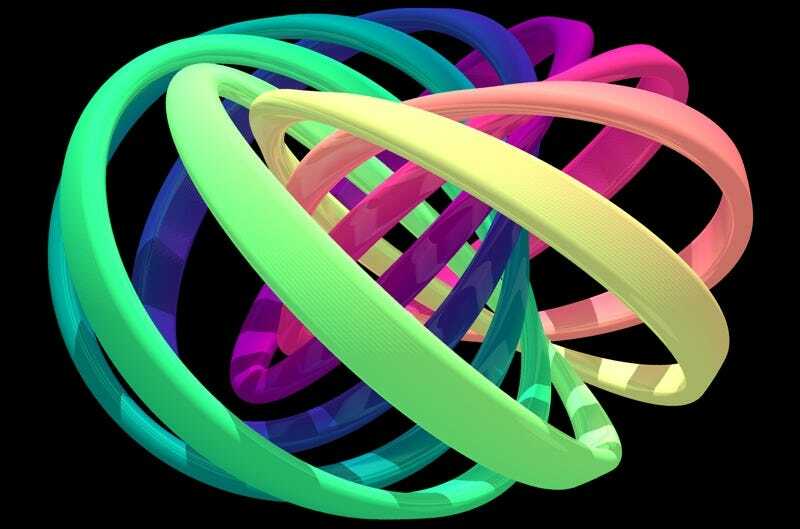 A mathematician might not consider these structures to be true knots; typically a knot is defined as a knotted circle, like a pretzel, while a rubber band would be considered an “un-knot.” Hall and Möttönen prefer to think of their structures as knotty solitons. And what’s a soliton, you may ask? There is a certain type of traveling wave that keeps rolling forward at a constant speed without losing its shape. That is a soliton, and such objects also show up in quantum field theory. As I wrote in a 2014 article for Quanta, “Poke a quantum field and you will create an oscillation [wave] that usually dissipates outward, but configure things in just the right way and that oscillation will maintain its shape” — just like a traveling wave. Möttönen read about theoretical predictions of quantum knots, and became intrigued by the possibility. After making a few pencil-and-paper calculations, he ran computer simulations to demonstrate what to look for in the experimental data, and teamed up with Hall’s research group at Amherst to test his findings. David Hall (l) and Michael Ray (r) with their experimental setup in the Amherst laboratory. Credit: Marcus DeMaio/Amherst College. First, they needed a medium — in this case a quantum state of matter known as a Bose-Einstein Condensate (BEC). At normal temperatures atoms behave a lot like billiard balls, bouncing off one another and any containing walls. But they do so more slowly as you lower the temperature. Get the temperature down to billionths of a degree above absolute zero, and the atoms are so densely packed, they start to lose their individual identities. You end up with an ultra cold sample of quantum matter. Physicists created the first BECs in 1995, 70 years after they were first predicted, but once they figured out the trick — and had the right technology — making BECs became routine. “Now it’s like you sneeze and a BEC comes out,” said Hall. More specifically, the quantum matter in the Amherst/Aalto experiments is a superfluid, since it flows with no viscosity. But all the effort and aching backs paid off in the end. “We started with absolutely nothing working and we worked for more than year before we got results,” said Möttönen. By the time they were done, “It was just matching one to one with the simulations.” The group has gotten much more adept at twisting knots into quantum fields since then, even managing to take movies of the knots they make. Quantum knots in a superfluid. Credit: David Hall. It inspired Thomson to develop a theory that atoms were knots tied in the swirling vortices of a medium then known as the luminiferous aether. At the time, it was believed this aether must exist to explain the strange behavior of light. An ideal fluid with no friction (zero viscosity) would make such rings stable, and the aether was conceived as an ideal fluid, much like the superfluid used in the Amherst/Aalto experiments. Different kinds of knots would correlate to different kinds of atoms — hydrogen or oxygen, for example. Tait even compiled a classification of types of knots, attempting to build his own version of a periodic table of elements. It wasn’t correct, of course: by the dawn of the 20th century, experiments had confirmed that there is no such thing as the luminferous aether, and without it, the theory doesn’t work. But some physicists consider vortex knot theory to be the original string theory. One of the open questions is what happens to these quantum knots over time. The knots are topologically stable: unlike the knots we tie in ropes or shoelaces, a topologically stable knot cannot be untied without cutting the rope, although you can relocate the knots within the rope. Similarly, the quantum knots in the Amherst/Aalto experiments cannot be separated without breaking the rings. “It can’t un-knot itself; it’s stuck in whatever weird way it’s been twisted together [in the superfluid],” said Hall. The only way the knot can escape its topological prison is to shrink, which it should do over time, because it will seek to minimize its energy, much like a ball wants to roll down a hill to minimize its potential energy. So these knots may not be dynamically stable. This is very fundamental research, so real-world applications are far in the future. Hall likes to think of scientific advancement as a pyramid, with fundamental research at the base. The design is still very much in the early stages, but it’s promising enough that Microsoft is collaborating with physicist Charles Marcus (now at the University of Copenhagen), among others, to bring the project to fruition. What would be really interesting is if the Amherst/Aalto group can manage to create more complicated quantum knots. Perhaps there is an entire class of these objects, much like the chart of real-world knots compiled by Tait in the 19th century. For Hall and Möttönen, this is just the beginning of the story. Top image: Visualization of a quantum knot. Credit: David Hall. Bottom image: Mikko Mottenen. Credit: Heikki Jantunen/Unigrafia.